RKFL's surface treatment is exclusively designed for the Forging components like Front Axle Beam, Knuckles, Stub Axle, Arms etc. To make the surface clean & free from oil, dust, dirt by spray of Hot Alkaline Solution. To Remove traces of Alkaline Solution. To Prepare the Surface for better Phosphate coating. To convert metallic to non metallic surface. Inhibiting corrosion and increase paint finish. Removal of loose traces of phosphate solution/sludge traces. To seal the phosphate coating from corrosion in prolonged storage. It is used for removal of moisture & water logging from pockets of complex structure parts. 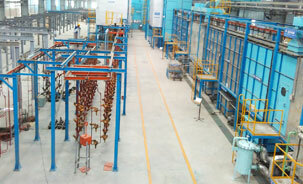 In the painting section we have options for Single Pack & Twin Pack Epoxy Coating System. The 20 KL large Dip Bath of Casting Sealer is capable of dip Coating of complete Axle Beam & all other parts which fills up the pores of shot blasted surface & provide better surface for further Anti Corrosive Spray Painting. The Twin Pack Epoxy Coating is being applied in the Manual Spray Painting Booth. The paint system, color can be varied based on the requirement of individual Customer. 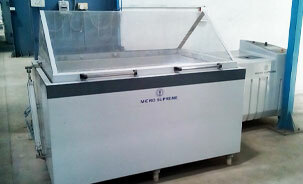 The Propane fired indirect Heating Paint Baking Oven is installed for proper curing of painted film. It is fully conveyorized process with no manual touching from loading till Unloading of the component. A separate storage conveyor is provided for giving adequate cooling period, which supports to harden the paint film & restrict film damage in hot condition. RKFL, as a partner to World Class OEMs are more concerned about the human health, environment, waste disposal hence ensured to use Hazard free chemicals in our processes. RKFL has well established in-house testing laboratory for process as well as paint testing with Scada based Salt Spray Test machine, Humidity Chamber, water Bath, Impact tester, Scratch hardness, Pencil Hardness, Gloss meter, Adhesion Test, DFT & other analytical process checking equipment.